Those who know me well, know that we put up more than twenty Christmas trees to celebrate the holiday season. A new one for us this past Christmas was the putz tree in our bedroom. Putz houses, also known as little glitter houses, were popular from the 1920s through the 1950s. There were small cardboard houses prior to that, but they were usually candy boxes. With the advent of light strings available to the general public so the houses could be lit, the little houses became the Christmas villages that were so popular during the first half of the twentieth century. You can read more about their history at the website Cardboard Christmas. 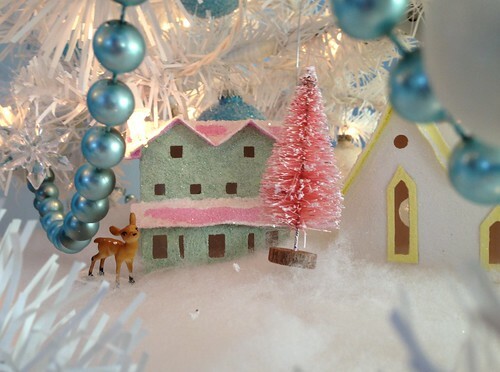 I enjoy crafting these little houses and have wanted for a long time to display them on a tree. Last Christmas, I got my chance. 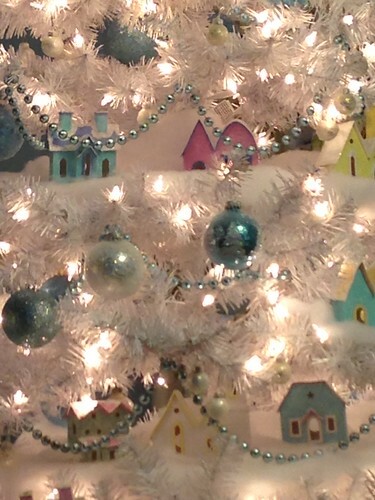 My sister Genny, who is a great thrift shopper, found the like-new white tree for $12.00, and it is the perfect tree for displaying the little glitter houses that I’ve made. The only problem the tree had was a broken stand, so DH built a box to hold it up. We covered the box with a white cloth, and then with sheer pale blue tulle that is printed with snowflakes. A little bending of tree branches made enough space between the branches to highlight the houses. 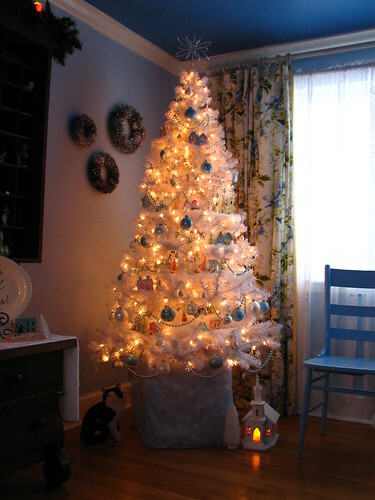 We used pale blue ornament balls, light blue beads and little acrylic snowflakes to decorate the tree. Setting up the little neighborhoods was fun. We put a piece of white poster board under each set of houses, placed the houses and then covered the board with batting. That provided a base that made arranging the houses a bit easier. The acrylic snowflake is visible in the picture below, between the tree and the house. I found bags of approximately 35 snowflakes. The little snowflakes are about an inch tall. They are intended to be used as table decorations at weddings, so did not have holes for hanging. DH and our friend Paul used a tiny drill bit and drilled holes in all the snowflakes…about 70 of them! We put fishing line through them and hung them on the tree. If you plan to drill through acrylic, be aware that when the drill bit gets hot, it will melt the plastic…take a break now and then! The deer were also glued to little pieces of poster board, which made it possible for them to remain standing. The little bottle brush trees did not want to stay upright, so we hung them from the above branches with long ornament hooks. Most of them stood up better than this one did. 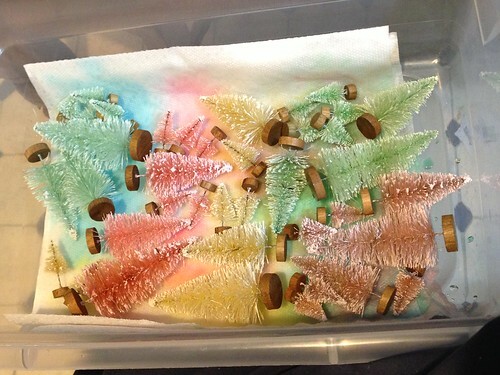 The little bottle brush trees were some ivory colored ones that I decided to try to dye. 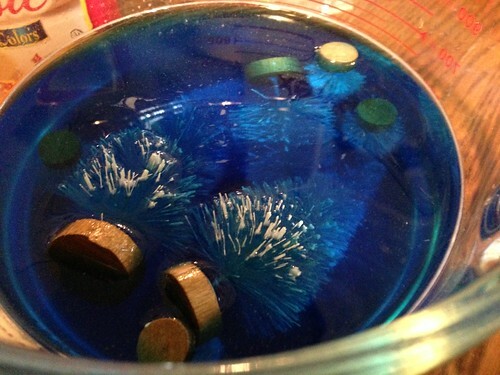 I put the trees in a pint of water with about a 1/4 cup of vinegar and added food coloring. I let them soak for about 20 minutes. It worked out better than I thought it would. They faded a little as they dried, but not by much. 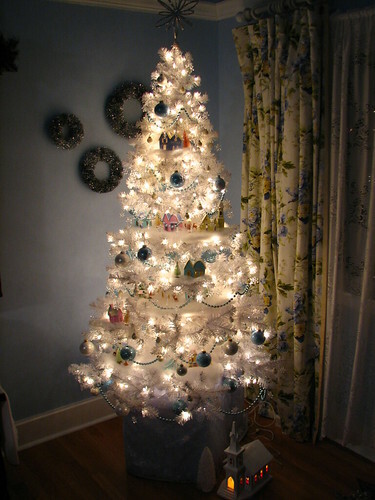 The pale colors were just right for the display in the white tree. 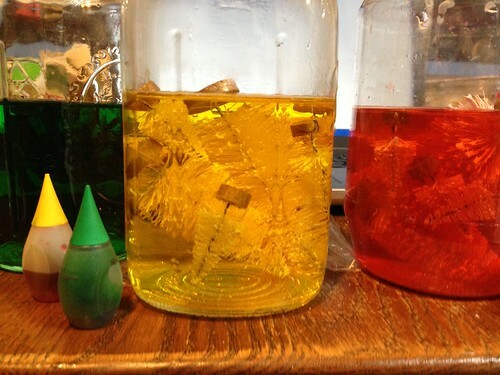 The ones on the right, below, were dyed with purple food color. It didn’t take quite as well as the other colors did. They looked rather brown after they dried. The tree turned out to be a new favorite. Maybe I’ll add more houses to it this year. 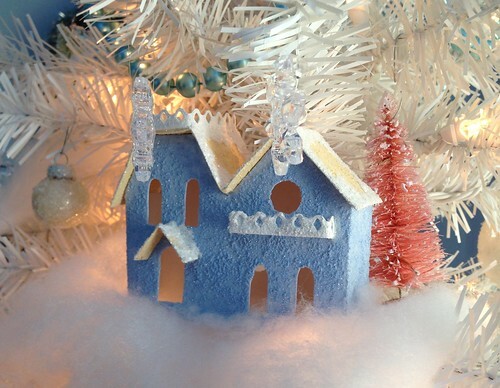 If you would like to see more of my Putz houses, as well as Christmas ornaments I have made from upcycled holiday cards, please visit my Etsy shop. This entry was written by ~~Rhonda, posted on August 9, 2014 at 5:29 pm, filed under Christmas and tagged Christmas, Christmas decorating. Bookmark the permalink. Follow any comments here with the RSS feed for this post. Post a comment or leave a trackback: Trackback URL. It really did come together well. I need to show this to the gals at the thrift shop. 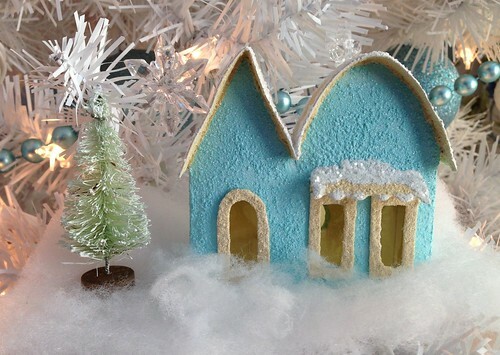 I love the little houses displayed in your tree. Just beautiful!